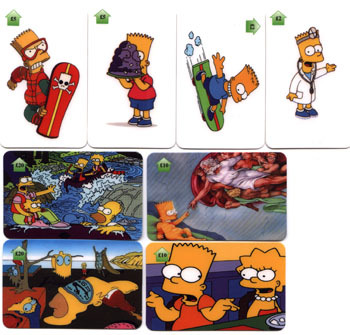 This set of 8 Simpsons phone cards comes from England. ¢G5: Snowboard Bart & Bart with Gelatin ¢G2: Skateboard Bart & Doctor Bart ¢G10: Whitewater Rafting & Cistine Chapel Ceiling ¢G20: Dali Painting & Confused Bart/Lisa . All cards are USED but worth to be included in your collection as they are no longer released..